Apple Turnover Accessory Board and Software for the IBM PC. Read, Write and format Apple Disks In Your IBM PC/PC Compatible. Published by Vertex Systems inc. labeled on the front "Civil Engineering No. 91043 University of Waterloo". On the spine of the case it is labeled " Master Disk, Kouwen". The Inside of the case contains a notice of an Open House In the faculty of science dated Saturday,26 October 1991. 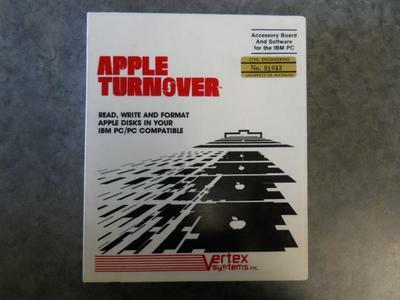 Next is the Apple Turnover User Guide, Various related 5 1/4" Floppy disks, and finally the Apple turnover board itself.